Drugstore.com is a pretty good website where you can purchase medicines, specialty foods, household items and more. They have a sister company called Beauty.com which shares the same cart as Drugstore.com, so this is pretty convenient if you also need some beauty items. What I really like about Drugstore.com is that you get free shipping on all orders of $25 and more. They also email exclusive coupons to customers. One time I was just about to purchase a video game for my son and remembered that I needed to check my email. Lo and behold, I found a $5 coupon in my Inbox which I immediately used towards my purchase, making this video game cost less than anywhere else on the internet. Also, you earn 5% on all purchases on a quarterly basis. After the quarter you can use the savings for future purchases. I think this is a pretty good deal. 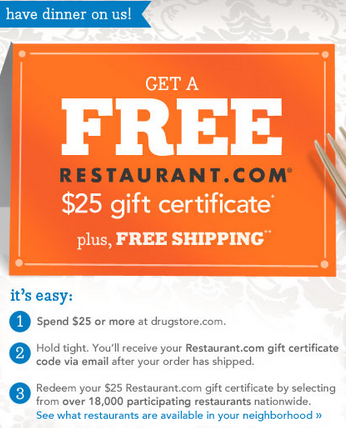 Drugstore.com is currently offering a $25 free Gift Certificate when making a purchase of $25 or over, see below for details of this offer.